Granite is an igneous rock. The hardness and durability has made it an accepted option as constructional material. The glossy and speckled look of the polished granite is considered as ornamental material also. Granite is mined all over the world. Granites are found in various shades. And the beautiful Lakha red granite is one of the popular choices to the homeowners. Lakha red granite is has a dark red backdrop and there are brown effects on it. The chemical composition of this granite is responsible for the exceptional blend of the shades. These exclusive shades are the most preferred choices not only in India, but all over the South East Asia. Lakha red granite is extremely popular for its energetic appeal and superb color. Lakha red granite is widely used for architectural purposes in interior and exterior walls, floors and also in monuments. They are available in various types of finishes like flamed, polished, antique, sandblasted etc. this granite are also used for countertops, vanity tops, wall claddings and floorings. It has very high dense grain, tough in quality and available in different sizes and shapes. These slabs are very famous for their durability, vibrant color, exclusive polish and finish. Lakha red granite is highly stains resistant and has a non-slippery texture. And this is why this granite is extensively used interior as well as exterior purposes. 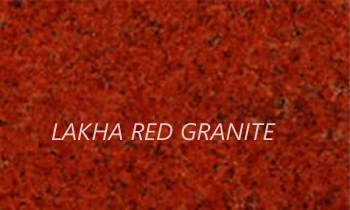 Lakha red granite is very much suitable for kitchens and bathrooms also. Because, it is stain, heat, scratch, water and pressure resistant. There are various world famous creations which are made of red colored granite. The use of red shaded granite had been prevalent in ancient Egypt. The great Khufu’s pyramid is made of red granites. Red is an auspicious color to the inhabitants of South East Asia. So, you can see these areas lots of usages of this granite. Akin to other natural stone, Lakha red granite is porous by nature. And it can be scratched, stained or etched if it is not appropriately maintained. Clean the Lakha red product with a standard stone cleaner and test to know if the granite requires to be sealed. If the granite will soak up the water left behind on its surface for more than an hour, then it means that the granite requires sealing. And if the water remains dropped up off the stone, then it means that the granite surface does not require sealing. Granite countertops are nice to look and adjoin value to any kind of home. But it requires proper care to maintain its value and beauty. You may tag along the following tips. Make a use of normal oil-based stone cleaner for your granite countertops. And always use a smooth cleaning pad. Never use any kind of abrasive cleaning pads. Wipe away any kind of spills as soon as possible. Otherwise, stains can be occurred on the granite surface. Reseal your granite once per year. The gorgeous looks of Lakha red granite will remain for years with your proper concern and will offer your home enhance beauty.